the space between refers to the non-specific ambiguity that exists in the art experience in the physical space, a moment in time, an understanding, or an interpretation. Foucault’s view that spaces are “informed by transgression” and the viewer has a relationship to a work of art from one's own perspective and each gaze of a viewer illuminates a different interpretation and aesthetic understanding of art, thus creating infinite views. It is about relationships between one element and another either physical, psychological, historical, or narrative influences. Each artist in the exhibition addresses these relationships with their chosen medium from painting, drawing, sculpture, photography and installation. Elena Bajo considers herself a “social sculptor” collecting and restructuring elements from urban life, arranging and transforming them according to her own aesthetic understanding. She says, “I am interested in the space between sender and receptor, in the circulation of messages, in the space of information de-coding, in the space between words”. Katie Holten as a “cultural filter” describes herself as a “compulsive wanderer, adventurer, and gatherer.” Allowing her work to take on many different forms as she preserves her “findings”. She has developed a unique language which combines memory and reflection for the individual interpretation of data. In the meticulous photographs of everyday objects Maria Hedlund isolates an image from its context. The viewer becomes sensitized to observe small peculiarities making the familiar objectified. Hedlund’s work plays with slowing down one’s observational approach and helps to make comparisons between objects. There is also an eerie quality in her work; there is no record or trace of human contact yet with the empty space one senses interaction. 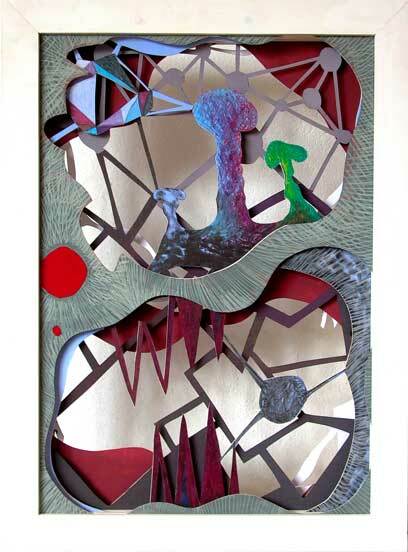 Cutting away and layering imagery are the techniques Stefan Saffer incorporates in his paper-cuts, hanging mobiles or paintings. While removing part of an image Saffer is conscious that he is creating new relations between the remaining spaces. There are formal artistic decisions made in the process and it is important that there be a play between the cut outs and the whole composition. the space between is an investigation of how the artist breaks down the barrier of space between the viewer and the viewed and how the artist mediates the moment in time when this experience seizes to exist. The intention of the exhibition is to look for art practices and artworks, which are dealing with “the between”, the indefinite view of interpretative space.